Hunting Snakes In The Everglades To Protect Native Species Burmese pythons in Florida are taking a big toll on native wildlife. To combat their spread, the state is holding its second Python Challenge — a hunt expected to draw over 1,000 participants. Fish and Wildlife Commissioner Ron Bergeron handles a snake as part of the Python Challenge in the Everglades. Several hundred people have signed up to take part in the monthlong python hunt. 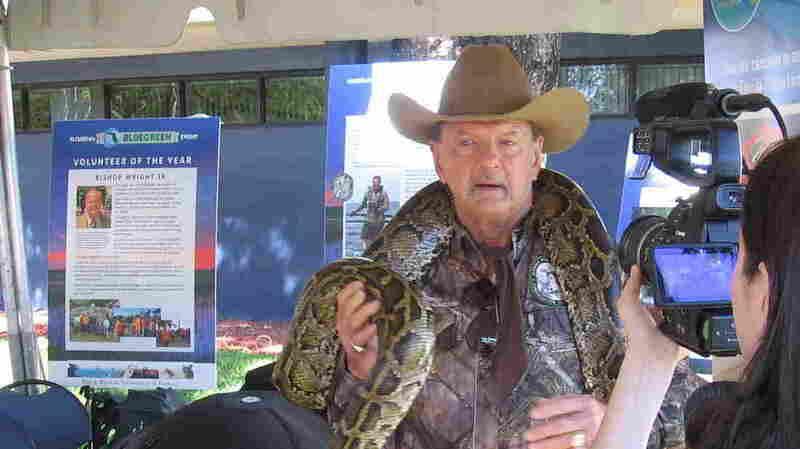 This weekend, Florida's Fish and Wildlife Conservation Commission held a kickoff event where it showed prospective hunters how best to corral a 10-foot long snake. Snake wrangler Jeff Fobb holds a demonstration as part of the month-long Python Challenge. While biologist Jenny Novack narrates, snake wrangler Jeff Fobb works to control and bag a Burmese python that weighs 50 pounds. "Now this animal has gone into fight behavior. He knows that Jeff is there. He's not happy about it. He's hissing a little bit," Novack says. She describes how Fobb controls the snake. "Then he's just going to grasp the animal right behind the head. He can feel the jawbones on his hand," Novack says. In the last python challenge, three years ago, 1,600 people took part, but they caught just 68 snakes. Researchers say there are tens of thousands of Burmese pythons in the Everglades. Catching them isn't easy. Finding them is even harder. Veteran snake hunter Bill Booth says in the last python challenge, his team hunted seven days before finding their first snake. They ended up taking second place. "We got six snakes, and one got away," he says, laughing. "We were being followed by National Geographic and they were filming a show. And they actually borrowed the snake from us to re-enact one of the other hunters. And they came back and said the snake got away. So, we wanted to kill them." Booth, a firefighter from the Tampa area, took a month off of work for this year's challenge. He grew up in Miami and says he spent much of his childhood in the Everglades. Burmese pythons, Booth says, have had a dramatic impact on wildlife there. "The thing is, you don't see anything. It's like a wasteland out there," Booth says. "I think in the 30 days that we spent on the last python challenge, I think we saw maybe one or two otters in 30 days. And rabbits and stuff like that, they're just not around." As preparations were underway for this year's python challenge, People for the Ethical Treatment of Animals called on Florida to tell participants not to cut off the heads of pythons they capture. The animal rights group said when decapitated, pythons can remain alive and writhe in agony for hours. Ron Bergeron is a commission board member and a longtime snake hunter who says the best way to kill a snake is whatever works. "You know, as an expert, I catch them alive. But we don't really recommend that to the public," he says. "It can be dangerous. A snake can turn around and bite you." Some Floridians are not just hunting invasive species — they're eating them. At the kickoff to the python hunt, chef Jimmy Rodriguez was serving up samples of invasive species. There were no snakes. But he did have two marine species — snakeheads and lionfish, fried. Plus tacos made with slow-cooked green iguana, an invasive species he says is taking over. "We're trying to educate the public on how gorgeous the texture of this meat is," Rodriguez says. "Not just the texture, the flavor." 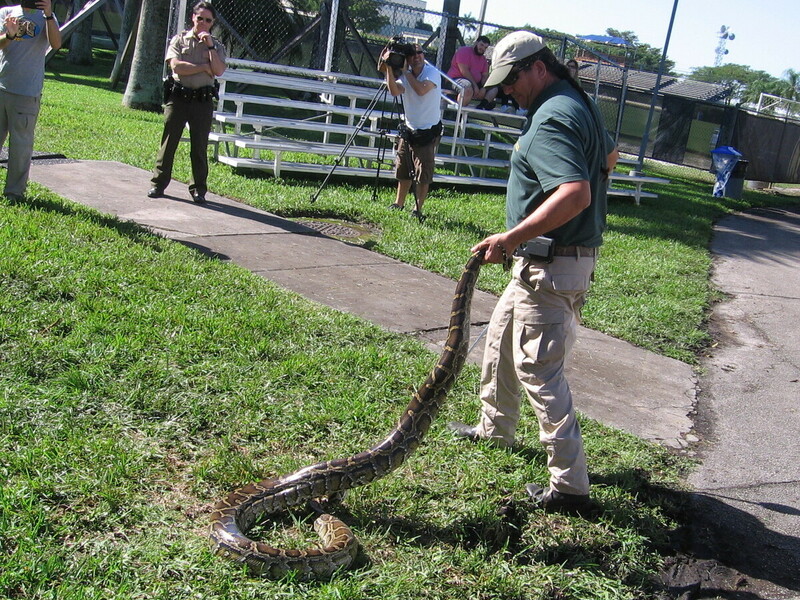 With the extensive media coverage, Burmese pythons have become Florida's best-known invasive species. The python challenge attracts people from across the country. Howard Hudson and his wife, Diana, came with their friend Chip Williamson from Cincinnati, Ohio, to join in what would be their first python hunt. "This is also just an adventure. We'd love to be able to help protect the native wildlife from the invasive species," Hudson says. "We know that they're really hard to find out there. But, I think we'll have a ball." I point out to the Hudsons and to Williamson that they'll be up against some serious python hunters. Hudson says they're not worried, they're mostly there to have fun. "We're going to enjoy ourselves and have a good time," he says. They could end up catching the biggest snake by chance. "You never know," he says. As for catching a python, the Ohioans say they think they know how to do it. They've seen it done on Animal Planet.